Linda Watkins currently resides in Western Michigan and, in another life, was a Senior Clinical Financial Analyst at the Department of Pediatrics, Stanford University School of Medicine. She was born on the east coast, but grew up in a suburb of Detroit. Upon graduation from college (Carnegie Mellon, '70), she moved to the San Francisco Bay Area where she lived and worked for thirty years. Taking early retirement, she moved briefly to Oregon, then to an unconnected island off the coast of Maine (Chebeague Island, ME). 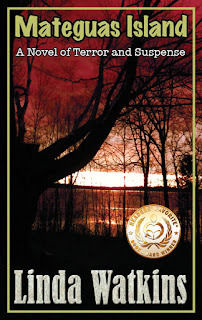 She lived on Chebeague for seven years and it was there that she wrote her award-winning debut novel, MATEGUAS ISLAND. The physical characteristics of Chebeague served as the model for the island depicted in MATEGUAS and, in fact, the description of house the Andersen family inherits is based on the 150-year-old home Linda owned, right down to the buttercup yellow floors she painted herself. 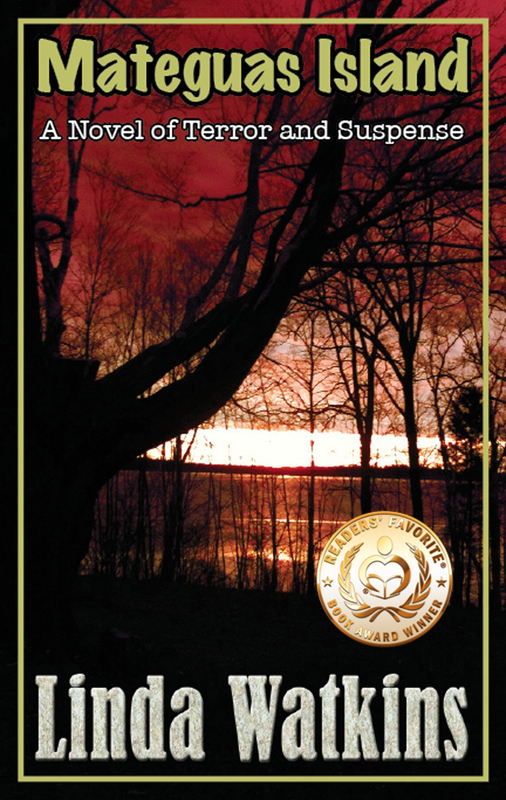 Linda moved back to Michigan in the summer of 2013 and, in 2014, both MATEGUAS ISLAND and its sequel RETURN TO MATEGUAS ISLAND were published. 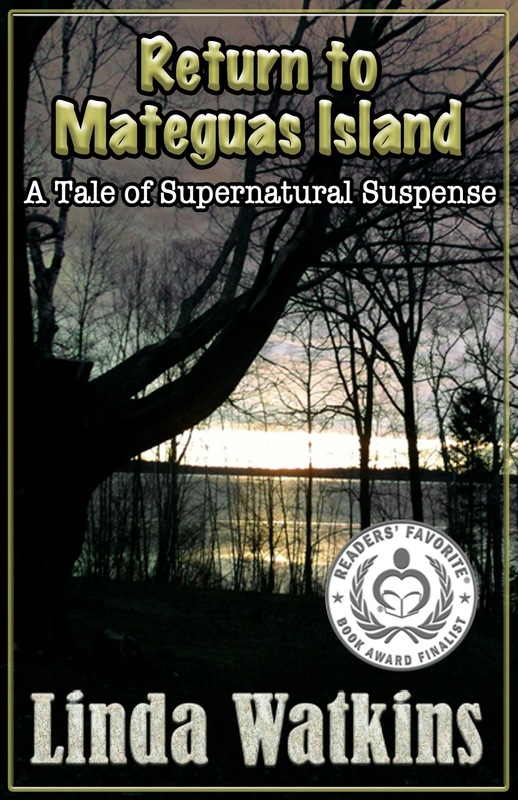 In addition, RETURN TO MATEGUAS ISLAND was named 2015 Finalist in Horror by READERS' FAVORITE INTERNATIONAL BOOK AWARD COMPETITION. Today, Linda lives with her three aging rescue dogs (Splatter, Spudley and Jasper) and is at work on the third novel in the series, GHOSTS OF MATEGUAS. 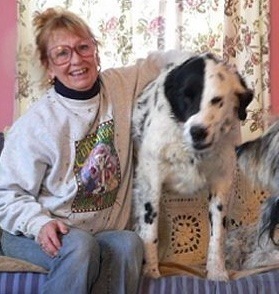 Serious about dog welfare and rescue, all net proceeds from sales of THE MATEGUAS ISLAND SERIES are donated to Linda's charitable trust, The Raison d'Etre Fund for Dogs, Dedicated to Rescue and Research. A.) I got serious about writing in early spring, 2010. Before that, I had only written poems, songs, and bits of whimsy for my own enjoyment. But in 2010, two things happened that changed all that. First and foremost, it was something my sister, who is also an author, said about my writing. I had been cleaning out cupboards and happened upon a short story I'd written years before for my father's birthday. It was just a piece of fun fluff and I scanned it into my computer and, on impulse, emailed it to her. She got back to me saying something like, "and I always thought I was the writer in the family!" That got me thinking. The second thing that spurred me to write a novel was the invention of the iPad. At that time, I was living on an island not unlike the one depicted in MATEGUAS ISLAND and depended upon a ferry to get back and forth to the mainland for appointments, shopping, etc. The boat only ran every 2-3 hours and that could mean a lot of 'down' time waiting. The iPad gave me something to occupy that time and, it was mostly on that device that I wrote the first draft of MATEGUAS ISLAND. A.) Number one would be finding the time to do it. I have two novels and a novelette out right now and, since I am independently published, it is on me to do all the promoting, advertising, etc. to get my work noticed. That takes a lot of time. Secondly, editing and knowing when your work is truly finished. I am constantly tinkering with my writing; always looking for a better phrase or way to get my message across. But there comes a point when you have to put that baby to bed, but finding that point is not always easy. A.) Excited and scared. I actually published my first piece by mistake. I'd written a short prequel to MATEGUAS, entitled SECRETS, A STORY OF LOVE AND BETRAYAL, that spans the two years before Karen and Bill move to the island. I used that piece for a test run on Amazon. After I loaded the manuscript and cover up on KDP, I hit the 'publish' button thinking that, like so many other websites, it would take me to another page, showing a summary of what I'd done and then ask me again if I wanted to publish. Boy, was I wrong! A.) Character. My books are very character-driven. The supernatural elements act as catalysts to move the plot along and help the characters reach their final emotional destinations. I try to make my people as realistic as possible and then put them in unrealistic situations to see how they'll react. I like to read novels in which the characters are rich and complex and, thus, that carries over into my writing. A.) I am the 'mommy' to three aging, special needs rescue dogs and my world revolves around them. One is diabetic and having a very rough time right now; another is almost completely blind and exhibiting signs of canine cognitive disorder (doggie Alzheimer's); the third has severe arthritis in his rear hips and legs and travels with me once a week to Grand Rapids for laser and acupuncture therapy. Needless to say, they take up a lot of my time - walking, feeding, medicating, loving, etc. When I'm not taking care of my 'kids', I'm usually at the computer either writing or promoting my work. When I'm working on a novel, I set aside blocks of time during the day to set down on virtual paper what I composed the night before. I do most of my writing in my head while I'm in bed, trying to go to sleep. It's then that my creative juices flow most readily. 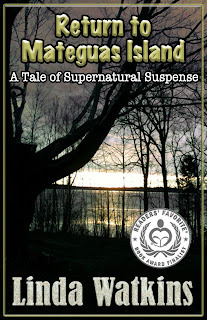 Have you read Mateguas Island?